Welcome to Part 2 of Making Learning Magical with Harry Potter! 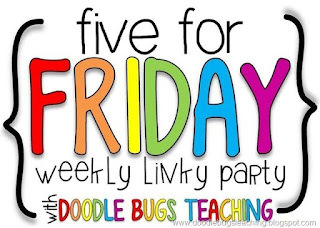 I hope you enjoyed the launch of our unit and reading all about week 1 last week. If you missed that post, click here to get all caught up! Week 2 started off with a bang! In chapter 4, Harry receives his Hogwarts letter. I printed the letters on parchment paper to make them look real. 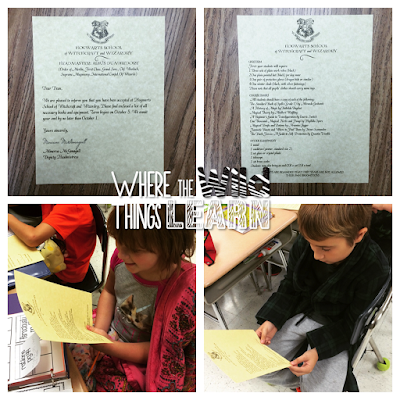 Students came in Monday morning to find their own personalized Hogwarts letter on their desks. They were ECSTATIC! Week 2 we focused on Chapters 4-7. These are long chapters, jam packed with information! I love how descriptive Rowling is in these chapters, and my students had such a a fun time picturing it all and describing it. 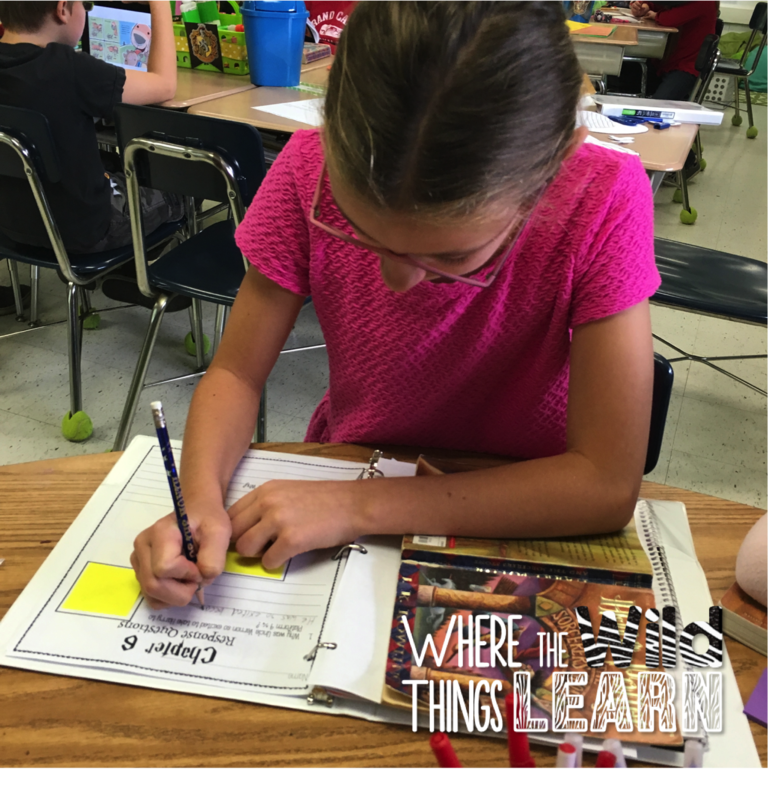 We continued with vocabulary and comprehension questions for each chapter. 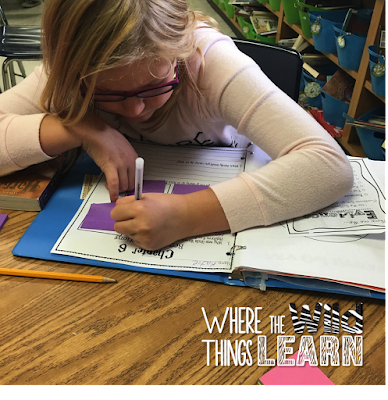 I met with students during small group time to work on comprehension questions, and students played Word Work games with their vocabulary all week. 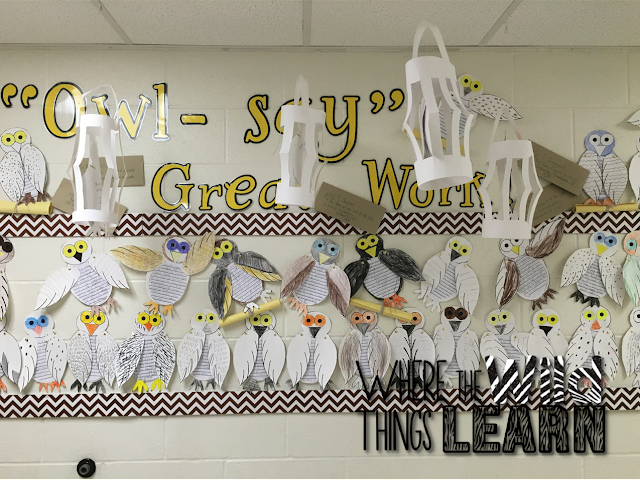 Our fun activity of the week was going shopping for our owls! After Harry goes to Diagon Alley in Chapter 5, and Hagrid buys him Hedwig, we did a little research! 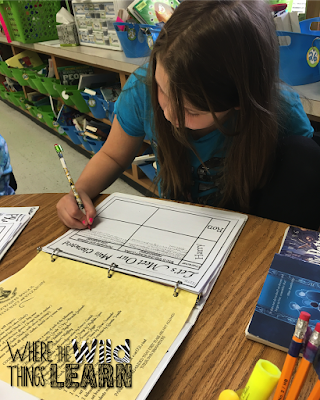 I gave students a guided research graphic organizer to get them started. First, we spent 5 minutes "owl shopping" as a class on the Smartboard. 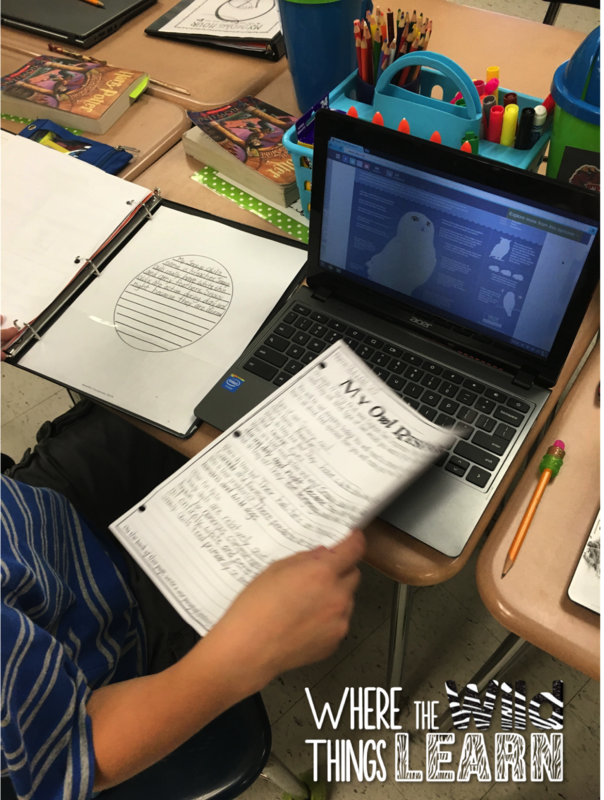 I pulled up pictures of all of the types of owls for sale at Eyelops Owl Emporium and students could choose the type they wanted. We spent two days researching, for about 20 minutes each time, to learn more about our owls. 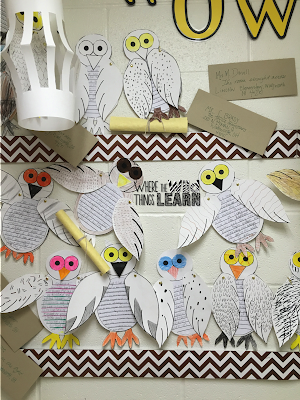 Then students wrote a rough draft of their owl story. We talked about how these were part real, and part fake because they had facts about the owls, but the name and story behind the owl was made up. Once students had their rough draft done, they traded and peer edited, and had me check it off before getting their final copy. Then the fun part--making their owls and their cages! I followed these simple directions for the Chinese lanterns to use as cages. 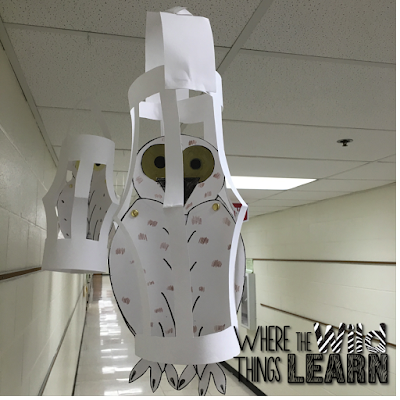 We used the 12x18 construction paper to make the cages, and I had students cut off every other strip to leave space in between the cage bars to see the owls. 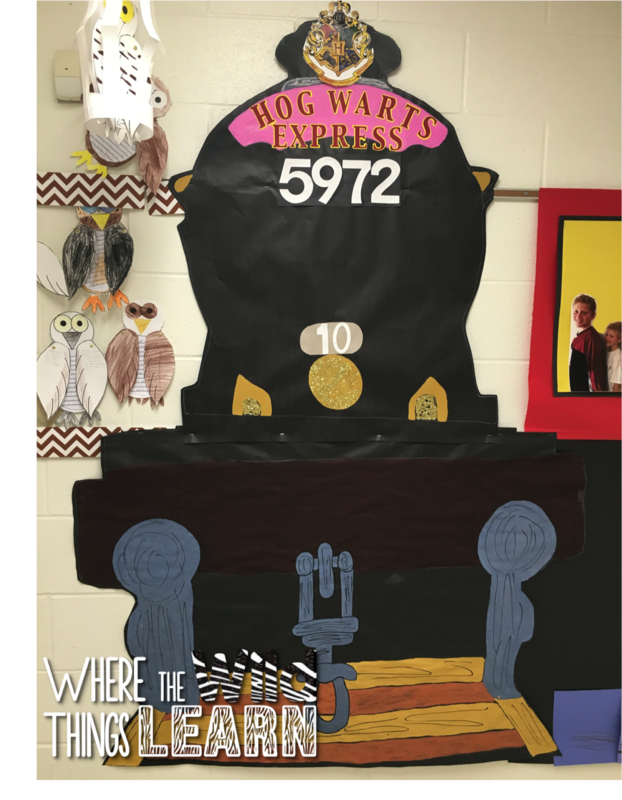 After reading all about Harry's journey on Platform 9 and 3/4 and the Hogwarts Express, it was only fitting that I added these details to the decor. With the help of some amazing friends, my husband, and volunteers, the Platform and train came to life! I took pictures of each student standing in groups the day before, but I didn't tell them what it was for. My amazing husband cut them all out and mounted them on yellow paper to look like windows on the train. :) Grandma Gale, our phenomenal volunteer helped SO much with this! For the front of the train, we put the black butcher paper up on my SmartBoard and projected a picture of it. We used pencil to trace, and then paint to fill in all of the details. The finished product is a stunning display! Since we started meeting the rest of our main character trio, we worked on a fun characterization organizer for them. The most vivid moment in all of the books to me is when Harry enters the Great Hall for the first time. 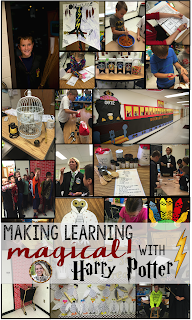 I wanted to create this magic for my students. I purchased 2 sets of these LED candles from Amazon, and used fishing wire and paper clips to hang them from my ceilings. My students love having these on during our DEAR reading time, when we turn the lights off and lamps on. To continue the magic of the setting, students did a Sketch It setting activity. For the front, they had to draw the grounds of Hogwarts School of Witchcraft and Wizardry and label each part. For the back, they could choose ANY setting from the story so far to draw. Then they needed a quote from the book to describe the setting. As usual, students BLEW me away with their descriptive drawings! As you can see, it was another AMAZINGLY successful week! 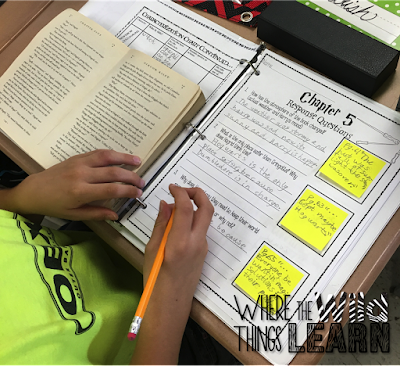 As the book progressed, I could see all of my students becoming voracious readers, and THAT is the most magical thing of all! I am so jealous that you get to do this type of reading and writing with your students. Where I teach, the district has taken the fun right out of teaching for the teachers. We are told what to do during reading and writing from people downtown. It is so sad and sometimes so boring. I have been teaching for more than 20 years and I miss teaching this way. Keep the posts coming. I would love to continue to read about your adventures. I am so sorry to hear that you are so restricted in your teaching! The WORST thing admin can do is keep teachers from being teachers. I love the freedom for creativity I am allowed and I truly see my students grow because of it! Thanks for your kind words! I will be hoping and praying that your district changes their stand point in the near future so you get to have a little more say in what you teach! :) Thanks for reading! HOW FUN! 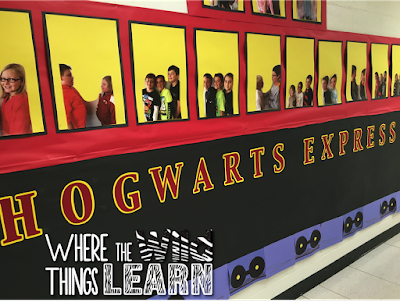 I am amazed by your Harry Potter fun! I've been planning to do this in January after winter break (need some planning time! ), so I've been listening to my students. They know I love all things Harry Potter. Sadly, I overheard one say his dad won't let him watch the movies because it has witches in it. How did your address this before you started? Did you contact parents? Aw, this makes me so incredibly excited and happy for you and your students!! This was something that I thought about a lot before I taught it, and to be honest, one of the reasons I haven't taught it in the past. I sent a letter to parents explaining how my passion for reading grew when I discovered this series as a child and all about helping their child find their true to heart book <3. 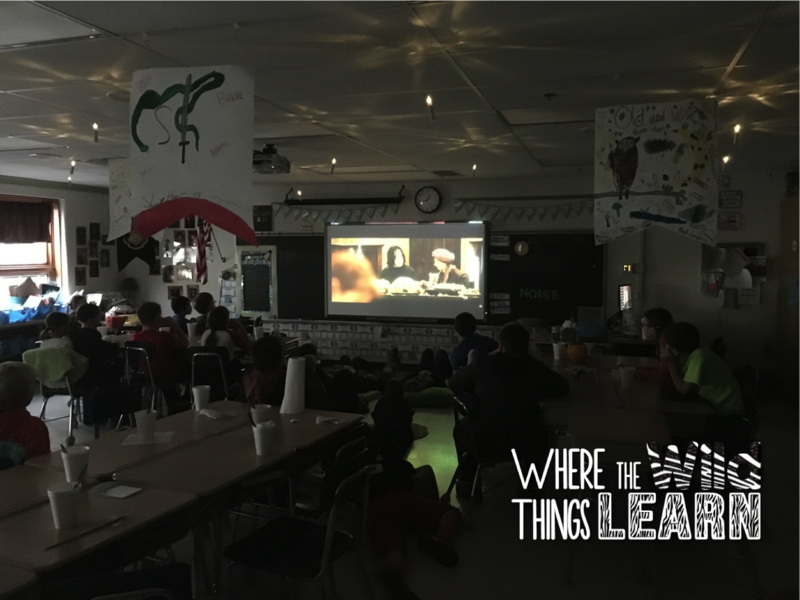 Then I sent home a letter about the movie helping guide the curriculum and make connections. I made this a permission slip, too. I didn't have one parent even question it this year, which was awesome! In the future, I will do my best to continue to explain the importance, and hope that parents see how positively it impacts their child! 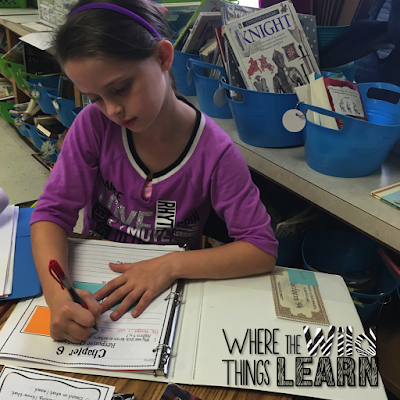 Are there examples of your parent letters in the unit? I so want to do this with my class next year, I'm moving to 4th advanced but I also worry about any parents not wanting or allowing their children to participate. You have done an amazing job with this!! What an amazing reading unit! Lots of fun, lots of common core addressed and students seem SO engaged in reading. Your class and teaching style are very inspiring. Thank you for sharing. Would love to try something like this. How long is your reading block time each day? How many days a week? Love the 9 3/4 platform! How did you cut a shopping cart in half? For the cart, we used a Sawzall saw to cut it in half and cut the front wheels off. Then used clamps to create "legs" so it would prop up against the wall. Then I spray painted the whole thing. :) I love how it turned out! You have left no detail out! I love it! So fun and engaging!! These ideas are incredible! I can't even imagine how excited and engaged your students must be! All of the decor is beautiful. That is so nice of your husband and other volunteers to help you! 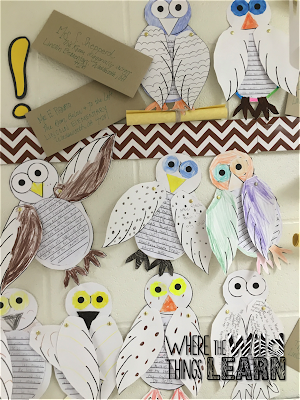 :) I love love love the owl projects!!! 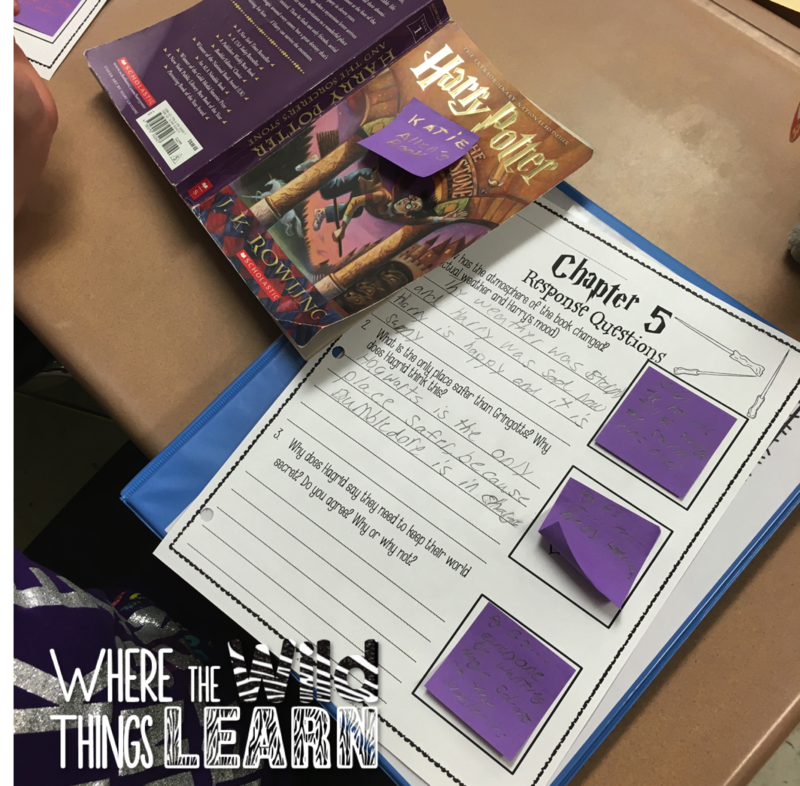 I am having so much fun reading about how you have created the Harry Potter world in your classroom. Thank you!!! Hello! I am LOVING reading about your unit, and can't wait to start it with my class- Last year I ran a Harry Potter after school program, and might again next year using this. 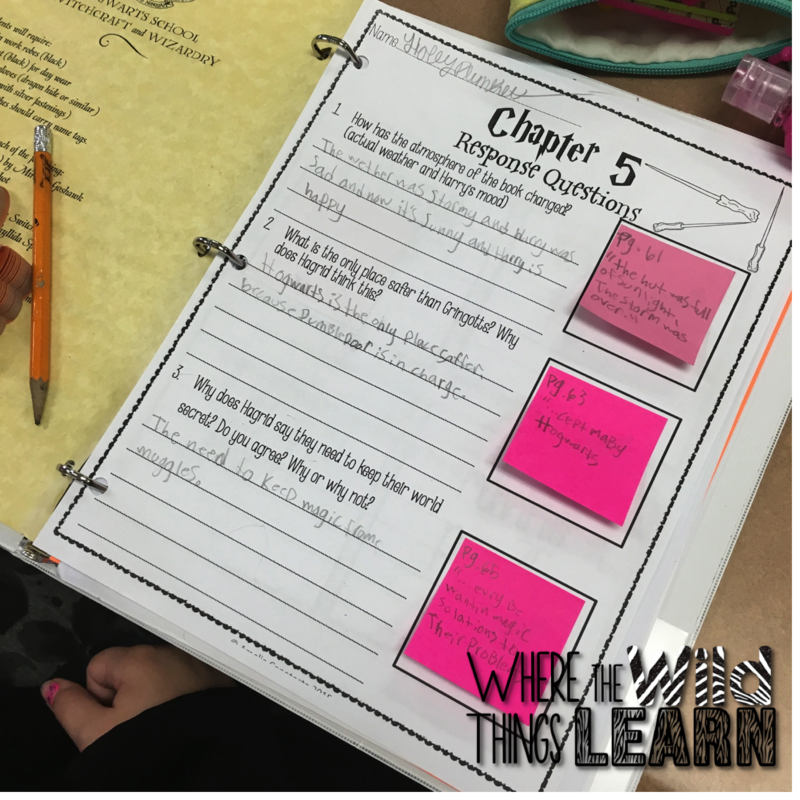 Just wondering whether you did this as a read-aloud, or if students read with you. It looks like students had their own copies, or a few extras to share. 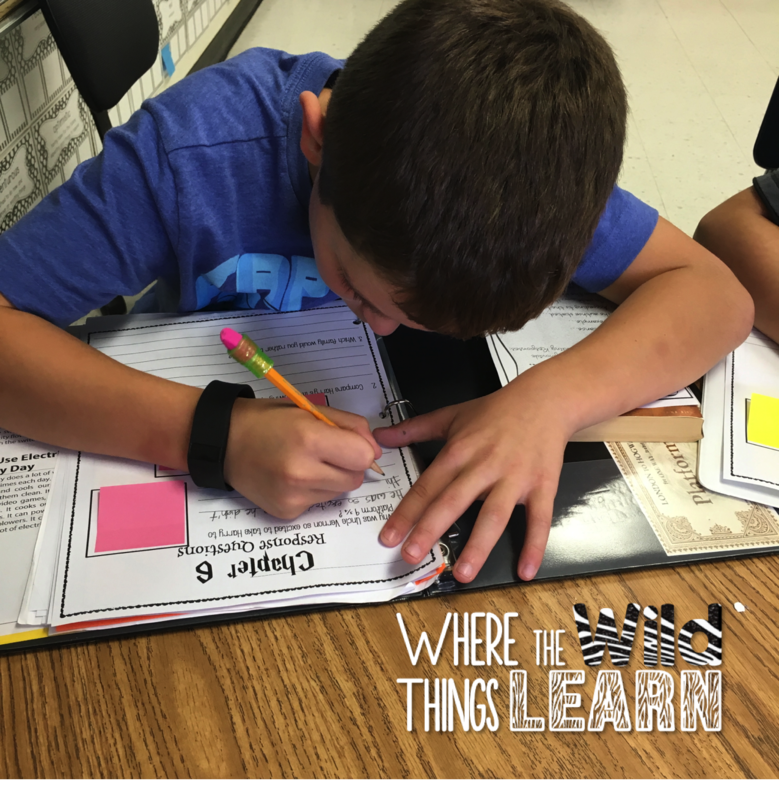 How did that look/work in your classroom? I was wondering what templates you used for the OWLS? I am eagerly wanting to do with this my students. 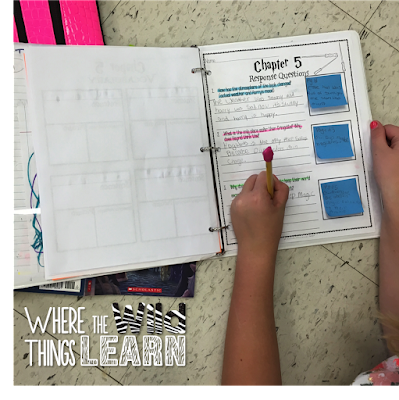 We start our 6 week lesson plan in a couple of weeks. Any help would be awesome! Thanks for the great ideas!!! !